Just two weeks before his death, Van Cliburn made a final gesture of friendship to the Moscow Conservatory. The 78-year-old pianist sold his beloved piano at auction and donated the money raised to the Moscow Conservatory. The death on February 27th of exceptional pianist and accidental emissary Van Cliburn caught the world’s attention. In Russia, the gifted artist who once said Russians reminded him of Texans was mourned as a native son. 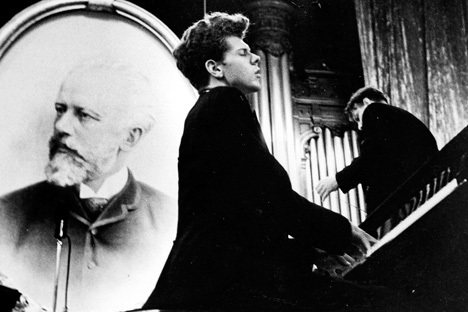 Russians of a certain age recalled Van Cliburn like a rock star. They were introduced to him when he won the first International Tchaikovsky Piano Competition in 1958. It was one of those transcendent moments during the Cold War, when music surpassed politics. “He was the brightest of stars, who shone in Moscow at the very first Tchaikovsky Competition – frankly Van Cliburn laid down the benchmark of highest standards which we are trying now to conserve. He was a phenomenal musician, and this is a great loss for the world,” Alexander Sokolov, rector of the Moscow Conservatory, told RIA Novosti. Van Cliburn’s fans in Russia memorized his biography: He first competed in Texas at 12, later studying at the Juilliard School of Music in New York. In 1954 he won the prestigious Leventritt Award. Just four years later he entered the newly created International Tchaikovsky Piano Competition in Moscow. Cliburn, an extraordinarily charismatic virtuoso who won over both the jury and the public, was greeted with ovations – and in one moment became Russia’s own, Soviet pianist. Composer Dmitry Shostakovich handed out the awards and, remarkably, Cliburn became extremely popular after this. People hung Van Cliburn’s portrait in their homes and people hung his portrait in their homes—his visage as familiar as that of a Soviet hero. After winning the competition Cliburn performed concert tours until the 1970s, after which he began living an increasingly solitary life in Texas. On his 70th birthday he performed a concert tour in Moscow, where he was greeted with standing ovations and enormous bouquets. Many of the female fans who had adored him in 1958 were there for the performances. In 2009, Van Cliburn returned again to Moscow to give a master-class in the “Glory to the Maestro” series held at the Galina Vishnevskaya Center for Opera Studies – a festival dedicated to the cellist and conductor Mstislav Rostropovich. In 2011, the pianist served as the Honorary Chairman of the jury for the Tchaikovsky Competition in Moscow.